Dhaka, Dec 28 (Just News): BNP senior leader Khandaker Mosharraf Hossain on Thursday warned that the consequences will not be good if their chairperson Begum Khaleda Zia is convicted unlawfully. "The government is trying to convict our chairperson. We would like to tell the government that people won't sit idly if our leader (Khaleda) is illegally punished. Our leaders and activists across the country will burst into protest if that happens," he said. The BNP leader came up with the warning while addressing a workers' meeting of Barisal north unit BNP at Ashwini Kumar Town Hall in the city. He said the government's main intention is to make their chairperson ineligible for the next general election by convicting her in 'false' cases. Mosharraf, a BNP standing committee member, said people will not allow anyone to hold any general election in the country without the participation of Khaleda and her party. 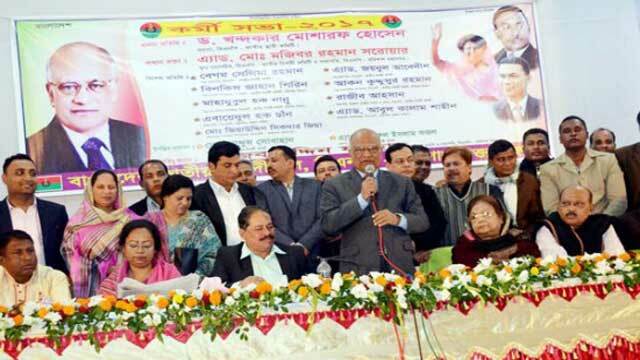 "No election will be held under Sheikh Hasina this time." He urged the government to take steps for arranging the next polls under a non-party neutral administration dissolving parliament. The BNP leader alleged that Awami League wants to hold the election under the current government as it knows it very well that most of the ruling party candidates will 'lose their security money' if people can cast their votes without any fear and intimidation. Mentioning that people's basic and democratic rights have been snatched, he said adding that people are now waiting to get rid of this Awami League 'misrule'.